Iggy & The Stooges drummer Scott Asheton, who played with the pioneering proto-punk band from their earliest days in 1967 through their 2013 LP Ready to Die, died Saturday due to an unspecified illness. He was 64. "Scott was a great artist," Iggy Pop said in a statement. 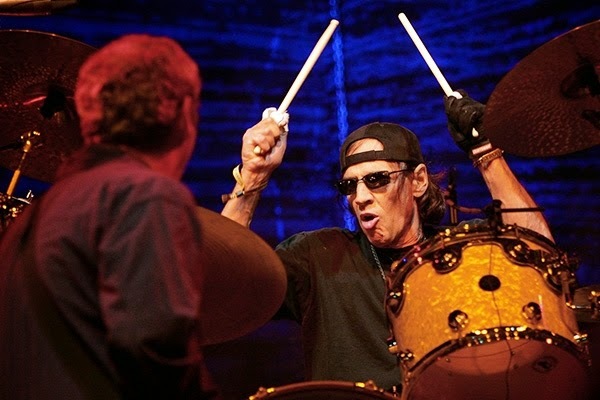 "I have never heard anyone play the drums with more meaning than Scott Asheton. He was like my brother. He and Ron have left a huge legacy to the world. The Ashetons have always been and continue to be a second family to me. My thoughts are with his sister Kathy, his wife Liz and his daughter Leanna, who was the light of his life." Asheton was born in Washington, D.C., but moved to Ann Arbor, Michigan when he was 14. He began playing music with his older brother Ron and their friend Dave Alexander soon after. "We didn't get very far," Scott told writer Brett Callwood in his book The Stooges: Head On. "We liked the idea of being in a band, we looked like we were in a band and we'd all hang out together. It wasn't until...Iggy, got involved that it actually became a real band." Under the leadership of Iggy Pop, The Stooges, along with the MC5, became one of the most popular acts around Ann Arbor and Detroit, eventually signing a deal with Elektra and releasing their groundbreaking self-titled LP in 1969. "We didn't have songs," Scott Asheton told Callwood. "A lot of that first album was written at the Chelsea Hotel in New York City over two days immediately before we went in the studio." The record - produced by John Cale of the Velvet Underground - laid the groundwork for punk rock, inspiring everybody from David Bowie to the Ramones. It's almost impossible to imagine how the 1970s would have unfolded had they not formed. "He was magnetic," Pop said of his first impression with Asheton in Paul Trynka's 2008 book Open Up and Bleed. "Like a cross between a young Sonny Liston and Elvis Presley." The album, however, was not a commercial success and the group practically dissolved after 1970's equally brilliant Fun House also failed to find an audience. After a brief break, Pop and new guitarist James Williamson headed to England and contemplated hiring new members of the group for their third album, though at the last minute, they called back Scott and Ron Asheton (though demoted Ron to bass). "We were told they couldn't find anybody else," said Scott. "We were going to be put in a sideman position in our own band." Many critics hailed Raw Power as the Stooges' best record, but it was another commercial disaster and Iggy Pop's growing drug problem caused the band to break up in 1974. Scott Asheton did play with Pop again very briefly on his 1978 solo tour, but throughout much of the 1980s and 1990s was largely off the grid, playing with a variety of Detroit acts, including Fred "Sonic" Smith's post-MC5 band Sonic's Rendezvous Band. In 2000, Dinosaur Jr.'s J Mascis and Minutemen bassist Mike Watt took the Asheton brothers on the road, playing sets centered around the first two Stooges albums. The shows were extremely well-received and captured the attention of Pop, who agreed to reunite with the band for Coachella in 2003. The show got a huge response, and the group soon had huge financial offers to headline festivals all over the world. For the first time in their long careers, the Asheton brothers were making big money and playing to enormous crowds. The Stooges recorded their fourth album, The Weirdness, in 2007, though Ron Asheton would die of a heart attack two years later. James Williamson quickly rejoined the band and the group continued touring. After playing France's Hellfest in June of 2011, Asheton suffered a severe medical injury on a plane. "He was on a flight to England when all sorts of hell broke loose," Iggy told Rolling Stone later that year. "Without proper medical attention right there he would have bought it." The Stooges continued touring with replacement drummer Toby Dammit, though Asheton did get back behind the kit at the 2012 Austin City Limits festival. He also played on the 2013 Iggy and the Stooges LP Ready to Die. As recently as two weeks ago, the group held out hope he would return, though they acknowledged it was unlikely. "Scotty is losing a step here and there," Williamson told Rolling Stone. "And he just can't keep up with that brutal touring schedule. It's just too tough."